Finding himself rushed into ordering a symbolic attack about which he had serious doubts, President Obama called time out and put the question to “the American people’s representatives in Congress.” Whether asking congressional leaders to authorize limited, proportionate air strikes on Syria will turn out to be a wise choice remains uncertain. But Obama’s self-confidence in rejecting what most advisers thought had already been decided—immediate military action—reminds one of JFK during the Cuban Missile Crisis, when he refused to choose between what the system insisted were the two, and only two, alternatives: attack or acquiesce. If we accept this as the defining operational objective at this point, is a limited U.S. attack on one or two dozen military targets the best way to achieve that objective? Can we think of other actions the United States and others could take that would be equally or even more effective in moving toward that goal? When analyzing punishment and deterrence of thugs in the course I have taught for many years at Harvard, I ask students to consider “WWGD.” An adaptation of the evangelical saying “What Would Jesus Do?,” it asks: “what would the Godfather do?” When the Godfather wanted to persuade a Hollywood movie mogul to reconsider his decision to reject casting his godson for a star role in a film, the producer awoke to find the severed head of his prized racehorse in his bed. When the Godfather wanted to define an enforceable constraint against incursions into his territory that other competing mobs would observe, he enlisted the leaders of the strongest other mafia families, isolated the two offending dons, and executed them overnight, along with several of their key enforcers. President Obama should challenge the community of strategic analysts to exercise their imaginations. 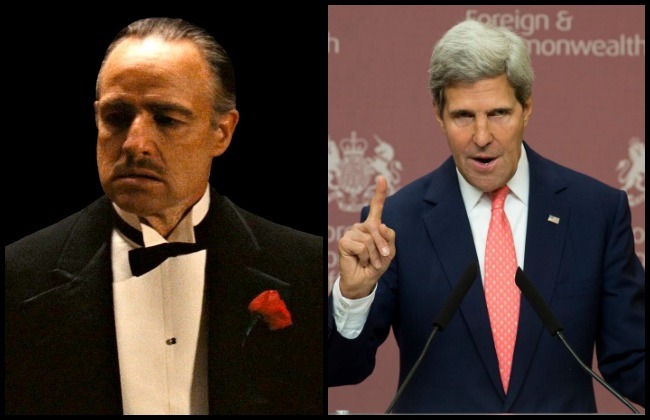 To strengthen the international taboo against the use of chemical weapons, to punish the Assad regime for violating that rule, and to deter Assad and his military commanders from using these weapons again, what would the Godfather consider? What might be the equivalent for Assad of waking up to the sight of the severed head of the creature he values most? To get the ball rolling, let me offer six clues. First, begin with the national interests of all the great powers, specifically Russia and China. Do any of these governments view use of chemical or other weapons of mass destruction as acceptable? Absolutely not. On this, all parties’ national interests are entirely aligned. So last month, or maybe even last year, the administration should have engaged Russia and China in serious conversations about how all the powers could work together to realize this shared objective. At this point, should-a-dones are history. But unless we imagine a world in which the United States stands alone as prosecutor, judge, jury, and executioner for the globe, building a norm that others agree to observe requires by definition that others in the international community agree. Even at this late date, talking—and listening!—to the leaders of Russia and China about what specifically they think the great powers can do to prevent future use of chemical weapons would be an essential starting point. Second, if a major reason for punishing Assad is to strengthen an international norm, others must agree that the Assad regime is responsible for the chemical weapons attack that occurred last month. The inescapable fact that Obama’s predecessor took an international coalition to war with Saddam based on claims about weapons of mass destruction that turned out to be false cannot be wished away. Assertions that the American intelligence community has “concluded with high confidence” that Assad’s forces used chemical weapons are no longer persuasive in themselves for citizens and governments around the world. Anyone tempted to forget that truth should reflect on the stunning rejection by the parliament of our closest ally, despite British Prime Minister Cameron’s valiant effort to make the case for military action. Third, make it crystal clear that this is not about Assad. Given the shifting sands in Syria today, it is likely that some chemical weapons will fall into the hands of opposition groups. Whatever the United States can do in this case, with whatever degree of support it can get from others, must become the standard for action if any faction should use chemical weapons in the future. The more this appears to be a back door justification for attacking Assad, the less effective any action will be in outlawing any use of chemical weapons. Fourth, in reviewing coercive options, follow the money. Assad, other members of his family, and key military commanders each have their own Plan B by which they hope to survive if the regime falls. Seize half the money in their foreign bank accounts—sending the unambiguous message that the rest is at risk. In 2005, the Bush administration froze $25 million of Kim Jong Il’s funds in the Macao-based Banco Delta Asia. While it was chump change in the larger scheme of things, blocking Kim’s own accounts made the issue personal for him. Moreover, this act caused a run on Banco Delta Asia that brought it to the verge of bankruptcy. The alacrity with which the North Korean regime reacted surprised even those engaged in the effort. Today, Russian banks and investors as well should face an offer they can’t refuse: stop financial transactions with Assad’s government or stop doing business in the United States and Europe. Fifth, think about analogues to the movie producer’s race horse. Besides himself, what does Assad value most? What matters most to his key military commanders who control the chemical weapons arsenal? Assad’s wife Asma thinks of herself as an international person, loves London and Paris, and sends her three children to the Montessori School in Damascus. Despite sanctions, she continues to spend tens of thousands of dollars on designer clothes, jewelry, and furniture from Europe. Thinking about targeting the incentives of individual human beings makes it hard to obscure the reality of blood—unlike the illusion of impersonality that allows cruise missile attacks to seem bloodless and costless. In retaliation for Libyan leader Muammar al-Qaddafi’s role in sponsoring the 1986 bombing of a Berlin disco that killed two American soldiers, President Reagan attacked Qaddafi’s personal tents in the desert with strike fighters, which killed his 15-month-old daughter and injured two of his sons. Sixth, peek in all the black bags, including new, covert means of causing pain and suffering, all the time keeping vividly in mind that even when coercing a mafioso, we must not forget our core values. The most obvious option is to launch cyber attacks that shut off electricity in Assad’s compound, leaving him without air conditioning or Internet service or phones for a week—or the lights in command centers or at the airport, or the water Assad drinks. For additional clues and analogies that could complement a limited cruise missile attack, challenge the wider community. Experts in the U.S. government know many things that outsiders do not, for example, about the capabilities of some American weapons systems. But those serving in government, even at the highest levels, have no monopoly on strategic imagination. Indeed, because of the tyranny of overloaded inboxes and the maddening difficulty of getting anything decided and done, bureaucratic processes tilt toward what is easy to do. As has often been observed, presidents of all persuasions find themselves gravitating to military options because military officers say: “yes sir” and just do it. In Syria, President Obama has only damnable choices: certain to be damned if he does, damned if he doesn’t. Having thrown the gauntlet to an inherently obstreperous Congress, he is wrestling with the reality that many members are clearer about their opposition to him than about what we should do about Syria. Understandably, he and his team will be consumed by efforts to persuade Congress to vote yes. But as the debate continues, the President should begin by releasing much more evidence about the attack and Assad’s responsibility for it. This should include photographs and intercepts that will make many in the U.S. intelligence community uncomfortable. Nonetheless, the test must be to present evidence sufficient to lead any fair-minded observer in Congress or a foreign government to come to this conclusion for himself—not in deference to U.S. assertions or appeals for trust. British, French, Saudi, and other nations should present more of their own intelligence in making their case. Simultaneously, the United Nations should be pressed to expedite analysis of evidence their inspectors collected on the ground last week and to report their conclusions. By stretching an extra mile in presenting evidence and argument, even if in the end the United States is forced to act alone, the President will have earned a measure of credit. If at the G20 meeting in St. Petersburg, Obama took Xi and Putin aside and proposed to send a small team of intelligence, military, and diplomatic experts to spend three days seriously exploring together their best ideas about preventing future chemical attacks and making a maximum effort to develop a joint approach, could they find some common ground? Uncertain, and perhaps unlikely, but even if that failed, Obama would again get credit for trying. At the same time, he should challenge American strategic planners to think way outside of the box, asking WWGD. With these strands and others, by the time Congress returns from vacation on September 9, the President should be able not just to ask for a positive vote authorizing U.S. military strikes when he thinks appropriate. He should also be able to demonstrate that this is one strand in a comprehensive strategy that employs all instruments of U.S. and international power to strengthen a pillar of the international order that prohibits use of weapons of mass destruction in the longer run—and causes sufficient pain now to Assad and his key commanders to instill fear about what they personally will suffer if they cross this line again. Graham Allison is a former director of the Harvard Kennedy School’s Belfer Center for Science and International Affairs and a former U.S. assistant secretary of defense for policy and plans. He is the author of Destined for War: Can America and China Escape Thucydides's Trap?